New Delhi, November 9: Over the years, the manner in which wars have been fought reiterates that success in battle is synonymous with supremacy in firepower. The evolution of the artillery as a dominating force on the battle field has been a momentous journey. The advent of gun powder and its use in warfare has been one of the greatest revolutions in military affairs. After 1971 till the year 2000 there has been only one major field artillery induction which was 155 mm/39 Cal Field Howitzer 77 B (Bofors). 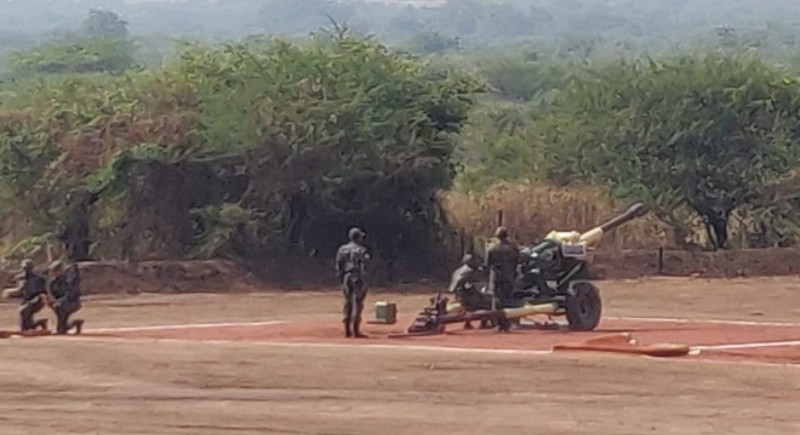 Defence Minister Nirmala Sitharaman attended the ceremony at Nashik inducting two different 155mm artillery systems which is the US-built M777 towed gun and the South Korean-origin K9 Vajra self-propelled howitzer. This is the first major induction of artillery by the Indian Army since the Bofors Scandal disrupted the Army's modernisation plans in the late 1980s.The K9 Vajra, a derivative of the South Korean-designed K9 Thunder, is a self-propelled howitzer system, which is being built in India by Larsen and Toubro. The induction of 100 K9 Vajra systems, being procured at a cost of Rs 4,366 crore, is scheduled to be completed by November 2020. The K9 Vajra can fire 155mm shells at a maximum range of 38km and can fire up to 15 rounds in three minutes. The M777 howitzer, designed by BAE systems, is a lightweight towed howitzer, which can even be transported by helicopters. The Indian Army is going to raise seven regiments using 145 M777 howitzers. The M777 is crucial for deployment in mountainous, inaccessible regions, particularly near the China border. India had signed a deal worth Rs 5,000 crore to buy the 145 M777 guns in November 2016. BAE Systems had announced in 2016 that Mahindra Defence would be its Indian partner for building and testing the M777.